After seeing Clear Sky Alarm Clock messages from all my Ontario sites, I thought it appropriate to check the predictions. Wow. Clear, for a change. No good Saturday night. So, a one-night opportunity. I decided to try for a quick backyard session with the little Meade ETX-90 Maksutov. Noted sunset was around 8:00. The sky would be without Moon (yeh) for 2 hours. Put on my big jeans, a long sleeve over the tee, my hoodie (still smelling of a campfire). Thought my boots would be appropriate for easy on and off. While setting up, one mozzie found me. Sheesh. Still around? Not cool enough to dampen them? Not enough bats either. Then I remembered! Dang. I gave rho the Good Stuff, my high-power DEET cream... Have I not donated enough? Tossed an extension cord from the deck. Set up the big Mamiya tripod. Attached the 'scope. Securely! Didn't want the thing to topple over again. Crude polar alignment. Fired up the motor. 8:53 PM. 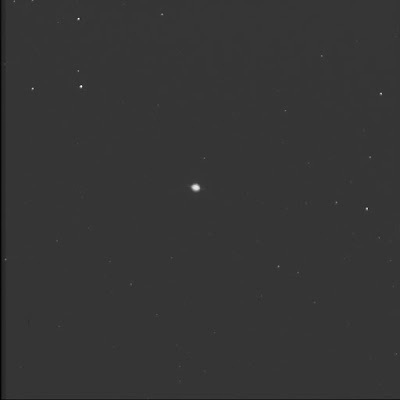 Viewed Mars with the Celestron 26mm Plössl (magnification 48). It looked good. Steady. Colourful. Made a quick dew shield with an old file folder. Found some bug juice, old stuff, dregs from a tiny Muskol pump. It'll do. 9:00. Put the Meade 18mm orthoscopic in (69x). Apropos, Meade in Meade. Unfortunately, this revealed the seeing conditions. Not great at the moment. Was it the sky affecting Mars or the trees at the edge of the yard? I thought I could see light and dark regions on the planet surface. Was the polar cap to the 11 o'clock position? Didn't seem like the correct direction. The neighbours had the bathroom light on when I re-emerged from inside. A little distracting but I was facing away. Then someone in the townies to the west flicked on their dining room or kitchen light. Flick off! A smoke alarm was triggered nearby. I heard scampering. 9:01. OK. I was ready to start a small campaign on... you guessed it: double stars! Double stars in a small 'scope tonight. The first choice was near Saturn. Took me a moment to find the dim planet. No. Too near the trees initially. I decided to try later. 9:16. Considered going to 44 Boo but it was setting. And the trees that way were are bigger now. 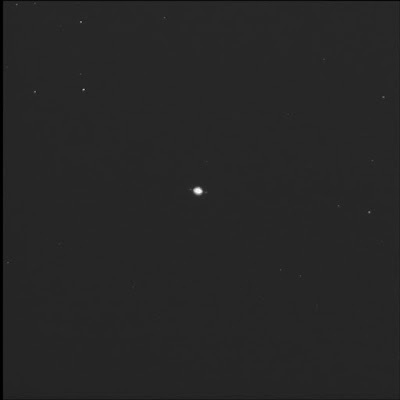 I could see θ (theta) Boo naked eye as I stood a bit south-east of the 'scope. 9:19. Also considered μ (mu) Dra aka Arrakis. But it was straight up. Nope. Not with this rig. Spotted it naked eye near the head of the Dragon. Turned south again. Had a quick look at Saturn. Tiny in the little telescope. Shadows in the field--still in the tree. But pretty. 9:25. Ah. I thought so. Spotted Titan at the 2 o'clock or east-north-east. 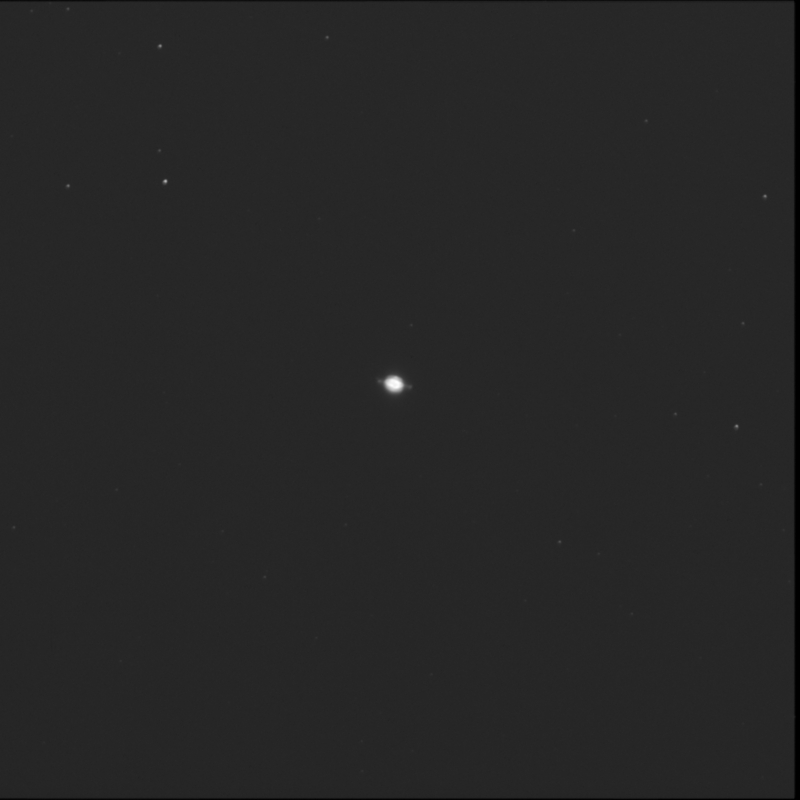 Oddly, my software showed Iapetus as being visible but I didn't notice anything obvious in the direction indicated. 9:29. All righty then. I star hopped to the Lagoon and ended up right at the edge of the tree branch. 9:45. Woo hoo. 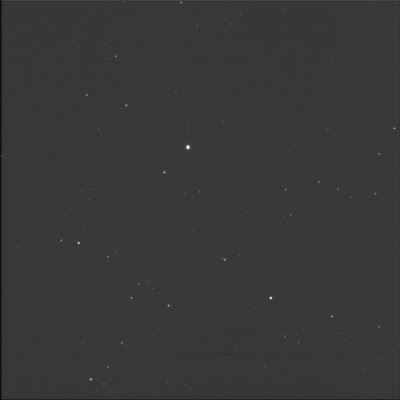 The teenie finder scope has a really wide field. I could see λ (lambda) and 12 Aquila as well as η (eta) Scuti no problem. I could also tag β (beta) and R Sct. I was certain that I saw a dim small cloud in the finder so I aimed to it. Bam! I was on the lop-sided cluster of the Wild Duck. That was easy! Moved up and left or north-west. I saw the pair, HR 7083, aka H 6 50. The A and C stars were easy. Yellow and blue. Viewed the whole sky. Nice night. Sagitta, Delphinus, Pegasus, Cygnus. 10:00. The lights on upper porch blazed on. Then the dog freaked out, hearing me rustling about below. The human could not control the beast so they headed back inside. And turned the light out. OK, thanks. 10:06. I hopped directly to μ Aql! Wow. Quick. Noted a little C-shape at the 4 or 5 o'clock. Um, more of an arrowhead. There was a triad to the north. Burnham 653 A was orangey yellow. I could see the E star easily though dim. It was inline with some other similar stars, tailing off up and right. Tried for the D companion. Not sure, even with the 18mm. The seeing was good. Quite good. Tried to see the double HD 184152 to the west too. No luck. Just too dim for this little tube. 10:16. Was the sky getting brighter? The Moon was not due yet. 10:18. Where to next? I couldn't get Cas or Cep—I had plunked down too close to the house. 10:42. Finally completed the long star hop (in the eyepiece) to HD 200392 aka BU 69. Three stars in a big hockey stick. The lower tighter two were the target of interest. A was a touch brighter than C. A and C were easily split. I noted in ST3P that it was a multi-star system. It will be fun at high power. Dim stars in Vulpecula, a challenging hop, but I think it's a keeper. It seemed like a little cluster. C'est tout. I quickly packed up. Happy. A little bit of play at the end of an intense week. Some observations of never before viewed objects. Quick and easy. The mount needs a bit of work. It is sticky or jumpy in azimuth. Huh. Clear. I peeked out the bedroom window for a second and say, without my specs, a couple of stars. And a bright orange point to the south-south-west. A quick glimpse of Mars. One month past opposition. So long! Good night. I attended, with a couple dozen other RASC members, the introductory orientation session for telescope operator candidates at the David Dunlap Observatory. Chris V gave us a tour of some parts of the dome, explained the need for new operators, highlighted responsibilities, and relayed significant operational considerations. I feel honoured to be considered. 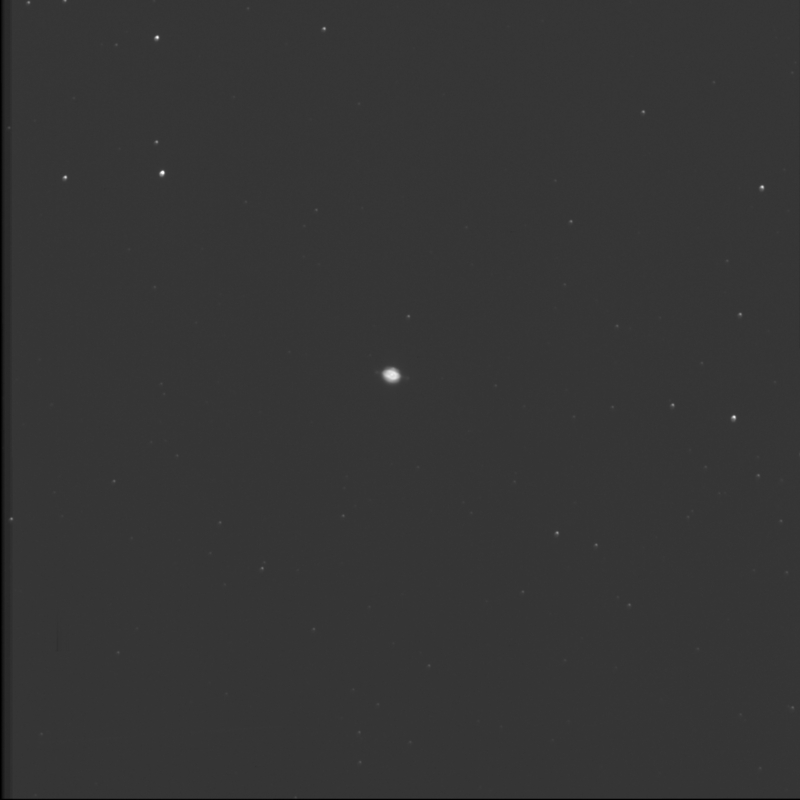 We found a workaround for loading new comets into TheSky6. Go to web site noted above (which is the new secure server). Wait for the page to completely load. Save the webpage as a text file, perhaps with a TXT ending, to any location, e.g. 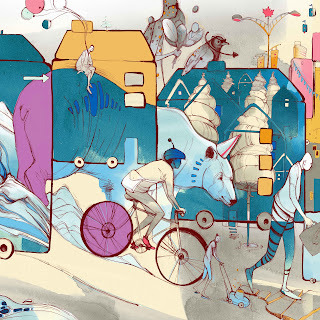 desktop. Locate the downloaded comet text file (it is expecting a CMT file extension) and click Open. Select the comets to add. If adding more than one, use Ctrl key. Uncheck old comets, as necessary, so to speed up the software and to unclutter the simulated sky. Delivering part 2 of my double stars presentation series tonight for RASC at the OSC. Specifically, I'll be talking about how to measure stars casually or with an astrometric eyepiece. The evening's programme will be streamed live started at 7:30 PM EDT. The rough cut of the live stream recording from 15 August 2018 is available for viewing. My double star talk entitled "Missing data" starts at the 32:20 mark and runs about 45 minutes. The companion article for the presentation is online at the RASC Toronto Centre web site. Moon and Venus were hazy and mingling in low cloud. Talked about Earthshine and albedo with Rhonda. Tried the Saint of Circumstance citrus blonde ale from Collective Arts. I like it better than the IPAs they make but it is still rather avantgarde with a strong fruity flavour. 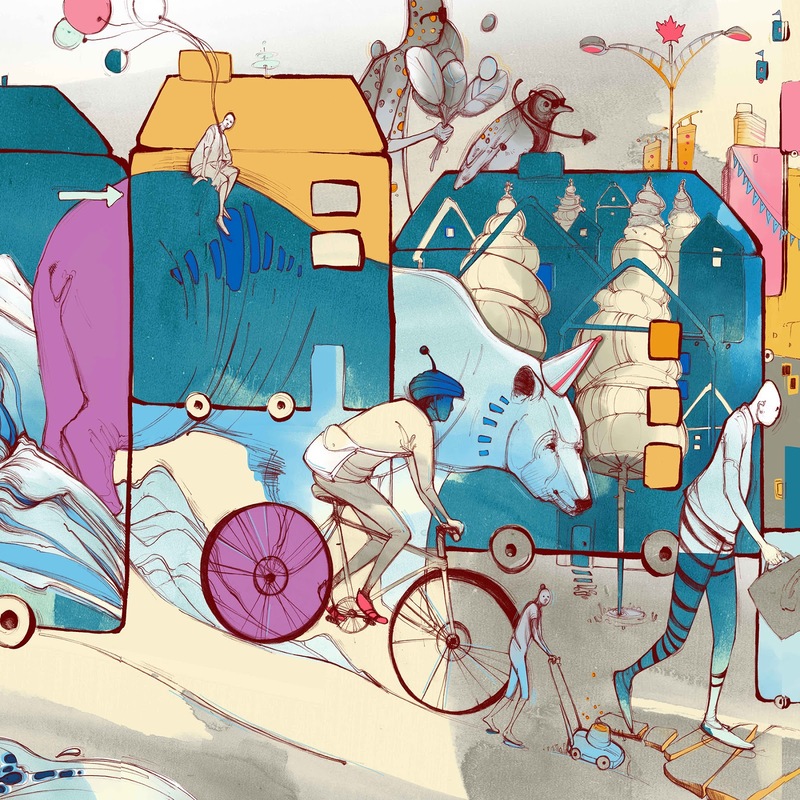 The can featured artwork by Matty Jenks from Boston. 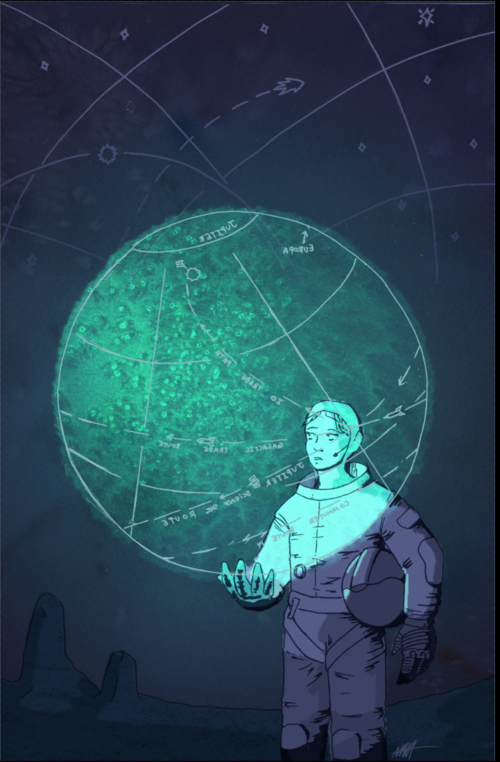 A pensive astronaut sans helmet examining a 3D map of Jupiter and area. Curiously, Rhonda and I had talked of the moons of Jupiter earlier in the evening. I finally started working on the LAN expansion in the late afternoon. The plan was to connect the new SLO observatory building to the site network. It took me a while to find the existing ethernet drop inside the Geoff Brown Observatory but I finally found the terminus where I was expecting it in the warm room. Still marked "BAO." I actually found it plugged into port 6 on the old switch. Bought a silly-expensive F-F junction from The Source so to easily extend the wiring inside the SLO. I built a patch from behind the door to desk area. Put male end on line from the GBO. Denis let me use his tester that he had coincidentally brought to test his cabling inside his pod. That made it easy. 12:04 AM. Slewed to next and switched eyepieces. Found a bunch of oculars on the east table, uncovered. Tidied the eyepieces and covered them. Dew was building. Bobbled one. Oops. Nothing to see here. Move along. Nothing expensive! Next. 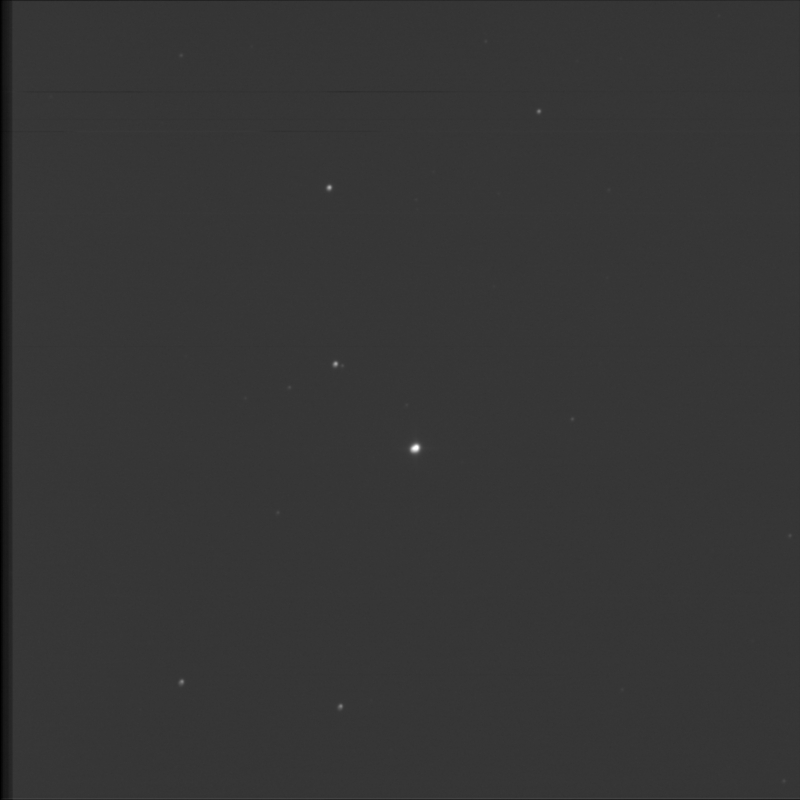 μ (mu) Draconis, specifically BU 1088 C.
Fetched another eyepiece from the cabinet. Tried the occulting eyepiece too. Next. Very short slew. HD 156162 aka SAO 30299 aka STF 2146. On my View Again. 12:42. A triple. I thought I got it. Yellow and orange. Super tight. None were bright. These were the A and B stars. A member visited. He reported seeing lots of meteors. I hadn't seen any yet. Chatted with Steve. They were both having imaging issues. Charline popped in. She had a look at the double. 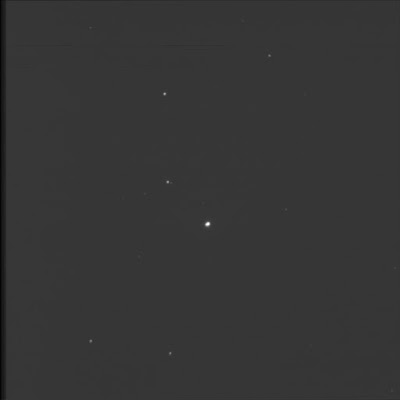 Chris offered a view of the comet 21P/Giacobini-Zinner in his Dob. They all headed out. There was another star. Wide. This was the C element. The software view didn't make sense. The brighter one was on the right or north-east; the dimmer was left. But I was seeing a pair on the left or the south-west. But was opposite. It was very marked. I wondered if it was an error in the software. The brightness values seemed wrong too. The wide pair was obvious at low power. [ed: The WDS agrees with the data values in ST3P. The designated system was 17131+5408STF2146. AC: 2016, 235, 89.3, 6.95, 8.87. Returned from viewing the comet. Big coma. Nice big oval. Nice tail. Really obvious. 1:04. Noticed the battery level was low for the recorder. Swapped in some alkalines. Saw a rhombus thing to the east. Chris said he saw a streak thing left of the Pleiades. Weird. Was it Steve? I asked Steve if it was Steve? He wondered if it was moving. I thought it might have had a green cast. It was nearly vertical, quite long. Steve fetched his camera and tripod to get a long shot. I said it would be neat to take a photo of Steve imaging Steve. It had changed. It was more diffuse at the top now. The sky was bright with all the light pollution from Collingwood. Chose NGC 6068 for my next target. In Ursa Minor. A random addition to my observing list. 1:15. I noticed that there were lots of clouds around. Faint. I saw something else. A faint diffuse oval patch. A little cluster of stars beside the galaxy. The gang saw a great meteor. Steve checked his image. It was a contrail. Hey! Confirmed! Two in the view. I did in fact see two galaxies. 1:17. Big one was centred. NGC 6068 proper was fairly large oval. Bright star to the east. 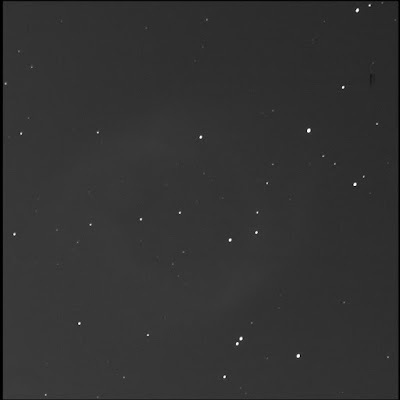 There was a smaller, dimmer fuzzy to the west, NGC 6068A. Nice! Offered the view to Chris. Asked if he saw the "surprise." Not a full on Arp. Really humid. Lots of clouds. Bad in the north. Perhaps it was the stuff I had seen over the Bay when I drove in. Steve checked the satellite imagery. He saw stuff coming in from the north although it was breaking up. West was obliterated. I considered targets by constellation. There was a big cloud straight up that made it seem like the Milky Way was huge. Moved to my next quarry, another double star. Near Skat. 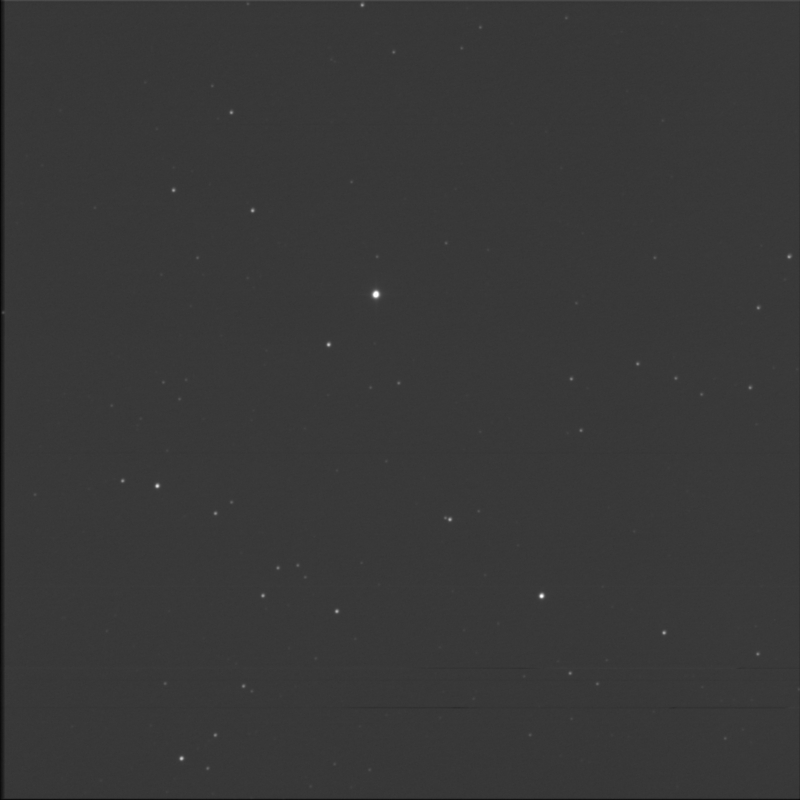 HD 215812 or STF 2944. Didn't see anything... SAO 146315. Verified. Slewed to Neptune. Asked Steve what he thought. Seemed right. But tiny. Verified the field. Bumped the power. Two pairs of two stars off to the right, with TYC 05248-1358 1. Triton was mag 13.5. It should have been at the 9 o'clock position. GSC 05248-1363 was the same brightness at the moon. Charline had a look. The separation was 13 arc-seconds. Put the 10mm in the mirror diagonal. "There it is." It popped! Charline wasn't sure. Steve saw it, well away, around 8 o'clock. Yep. Not a stunning image. Chris saw it. Helped Charline see it with averted. Dropped the power, to the 18mm, now that we know where it is. Crisper. Got it with averted. I had aimed to Aquarius before as it was clear; now it was Skat with clouds... Ha! Tried for NGC 6632 in Hercules. Right on the edge of the clouds. Che. Pfft. "That's all I get?" It's big but not bright. Mr McKinney had a look. Faint. Yep. Bright core. Pretty big. Canted. Not too exciting. Lots of field stars. One of the ones automatically added. Focuser slipped on Steve. He adjusted the tension. We wondered if something was wobbly with the slo-mo. Rubbery feel. Chose something a bit higher. ζ (zeta) Her. Steve spotted a meteor. We chatted about SB computers. Power and focusing. He's running Ubuntu. Sounds like a very neat solution. 2:16. I saw a super fast meteor down near the right hand side of Cap. Got one! I didn't see anything. Neither did Steve... We tried to figure out the field. Steve saw a bunch meteors. 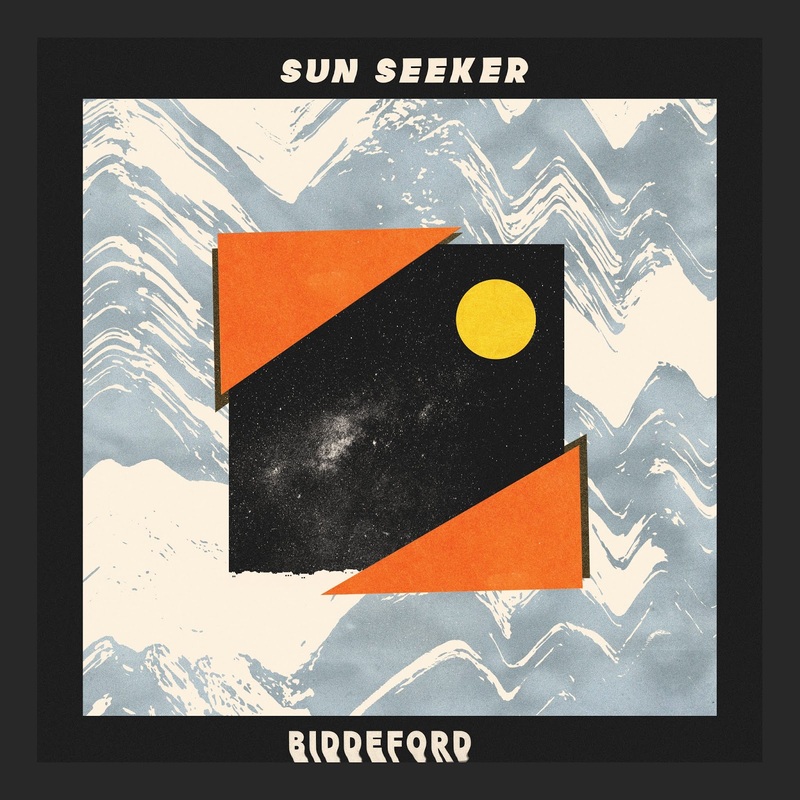 One was not Perseid. Shut up. We both saw a meteor. Going the wrong way. Then one through Andromeda. We continued to sort the field. 2:35. Oh, wow! Super fast speck of dust. Left a train. Above Pegasus. To the right of Cas. Clouds in the west. Felt like we were in a bowl. 2:43. Searched for a target. Changed the class to stars to filter out fuzzies. Lacerta. SAO 51698 aka V402 or HJ 1735. There we go. In the big 'scope, a nice multi-star system. Nice colours. Beauty. D was to the west. B was medium to the right or east. C was below B, south. D and A were the same colour, kind of lemon. B was blue. Awesome. In the Tele Vue, I could see A, B, and D. Oh. Discovered the TV101 had the 5mm installed (I thought it was the 10 the whole time). From my double star candidate list. A very good choice. Done. Parked the 'scope (with Steve's profile). Steve was packing up too. I closed the roof. Closed the flaps. Fired up the dehumidifier. 3:09. In bed, in the Orion room. That was an OK night. Disappointed with Mars (er, the elusive moons). Really cooled off, needed multiple layers to keep warm. No bugs. Yeh. Glad Chris gave me the big OTA to play with. A bit of fogging of the eyepieces but not too bad. Fired up my netbook computer. Set up on one of the west tables in the Geoff Brown Observatory. Installed the red film (temporarily). We viewed Mars. The south ice cap was very obvious. Some dark regions were visible. I wondered what features were facing us. Good to see again. I saw a point of light about 5 or 6 planet diameters away. This seemed to match the view presented by my SkyTools 3 Professional software. We used my occulting eyepiece in the GSO 16-inch RC telescope. Steve thought he saw an even tighter object. Very close. In the diffraction ray. That seemed too easy, to me. Deimos was 11.6; Phobos was magnitude 10.5 and very tight to the planet. Mars was -2.6! Bright. Chris didn't see it. Steve said there were 4 rays. Yeah. Vertical ray. Second ray down. Just below the second ray. Very close to the middle. Steve said there was a faint point 3/4 of the field (from centre). Oh. That's a star. I couldn't get ST3P to show the field stars in the area. Ensured the time was correct (or current). Steve saw a good Perseid, along the Milky Way, which left a smoke trail. Anne was curious about the eyepiece. I explained how it came to be. Occulting eyepieces are useful for bright planets or tight double stars. It seemed like the field was wrong in the software. The polar cap was at the 1:00 or 1:30 o'clock position for us. False alarm. Sorry. My ST3P settings were not right. When I put south pole of the planet at 1:00, the stars weren't right. Checked the telescope settings. Compared to other reflectors. Inconsistent. Turned off the planet icon in the chart. Asked Chris for the eyepiece focal length. We discussed telescope types. I argued it was a reflector. After some changes to the presentation settings, I thought I had the field right. Reset the time again. Chris saw a triangle of stars. 10:50. I was curious the weather conditions. I amped up the humidity setting in ST3P to dim the field. Chris was working on an asterism. I compared the field to his chart view from SkySafari. No... no... the brightnesses were not right. I suggested to Chris that we move to a known-good to verify the field orientation and presentation. He proposed Saturn. That would work. We programmed TheSky 6 and the Paramount slewed. Oh. It flipped over the meridian. Oh well. Titan was at 2 o'clock. Two moons at 9 o'clock, faint and close. Rhea and Dione were way off at 8 o'clock. Chris spotted a nearby asterism. I got my software sorted finally. Chris confirmed with his app. Mimas was mag 13.2. Iapetus was 11.4. We talked about flipping options in software. OK! We headed back to Mars. 11:20. Chris thought he got it. Showed Steve. One ray, a strong one, went straight out to the right. He saw a point touching the top edge of the ray, about 25% of the way out. They thought it was Deimos. 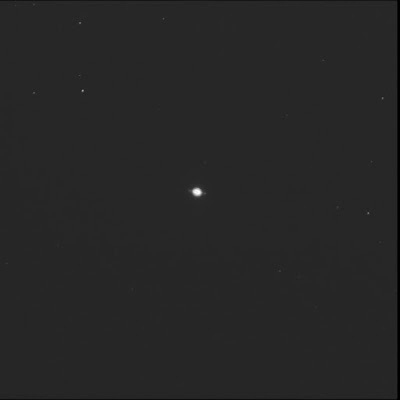 Phobos was now behind the planet... Steve saw it for a second. They worked some other field stars. Chris didn't think the stars were good in SS. And it only went to mag 13. As I returned from the house I noted all the planets: Venus, Jupiter, Saturn, and Mars. Out of the corner of my eye, I kept thinking that Mars was an Iridium flare. I confirmed a pair of stars. The field of view looked right, at last. Continued checking. 11:29. Sat down. Moved the computer nearby. So to do a deep star field comparison. I had to put the chair very close to the pier. It's a bit trickier now with the GSO as it is more forward in the cradle... Deimos should have been at the 4 o'clock position. Denis popped in for a bit. He was imaging and happy that everything was working for him. Resolved network issues at the CAO. A strange glitch. I could not connect to the routers on the site. Tried the GBO and house wireless access points. 11:15 PM. Wondered if the GBO router was causing the trouble so I killed its power. As the GBO WAP restarted, John Repeat Dance tried to connect. Was not getting an IP address for my 'droid phone or Windoze computer. Something was wrong with the DHCP server. Steve was having trouble too. I rebooted the main router in the basement. 11:25. When I heard my phone notification for new emails, I knew we were up and running. Steve said his telescope router had just connected to the CAO WLAN. Sent Rhonda a text, at last. Arrived the Carr Astronomical Observatory. That was a quick trip! About 1 hour 45. It was dark and I didn't want to disturb the observers or imagers so I drove up the lane with headlights extinguished. Parking lot was pretty full with vehicles. Hey. Someone was in my spot! No reservations for ex-officios, I guess. Shut down beside the Chows. Tried to turn off my cabin light but the switch didn't work. Gah. Tried several times. No luck. Tried removing the assembly but couldn't get it out of the roof liner. Oh boy. So I climbed out, as best as possible covered the light with my hand (and head), quickly unloaded the gear from the back seat of the car, and stacked up items beside the back wheel. Headed to the Geoff Brown Observatory in search of the supervisor Chris. Found the assistant Steve. He was imaging from the Observing Pad by remote in the Warm Room. It was pretty empty in the GBO—I thought it was gonna be busy for some reason. Headed to the house. Found Chris at the kitchen table. Signed in. Tried to connect to the wifi to ping rho about my status—couldn't connect. Weird. We sauntered outside where the super said I could use the 16-inch if I wanted. Sweet. Returned to the car. Rolled up the window. Hauled gear to the house and observatory. Lovely view. Four bright planets out. Venus ahead of me, getting low, turning yellow. Jupiter, Saturn, and brilliant Mars from the side window of the car, in a darkening sky. Rhonda called out, "Mars is up!" I smiled. Closet astro-geek. Lovely brilliant warm orange, in the notch of trees, along the south edge of the yard. Close to Earth. Read the article about the recent NASA senate hearings. US senators were collecting responses in preparation for budgeting and directions for the space agency. Various scientists (including Dr Seager) and administrators were on hand. An interesting message emerged emphasising the need to continue exoplanet studies and solar system body research. We need to continue our search for life in the Universe. Asked BGO to aim at GSC 03694 02703 so to capture multi-star 7 Persei, aka Burnham 1170. Also in the field is STI 1830. They are in an interesting field. These systems are not far from the Double Cluster. The robot in Halifax reported that the observation "was not fully completed!" I only received the luminance and red channels. Clouds, it seems. Regardless, I can see the elements I was interested in. 7 Persei is a 5-star system. The brightest star is 7 Per A proper. Nearly due north of A is the B star. Rather dim. The D companion is the brighter star to the south-east. About double the AB split. Finally, the E element is to the north again, slightly east, further still than B, and a touch dimmer than B. About 3 or 4 times the AB separation. STI 1830 is an attractive pair well away from 7 Per, to the south-south-west. Relatively tight. ST3P says 10.2". Unequal. Nice. 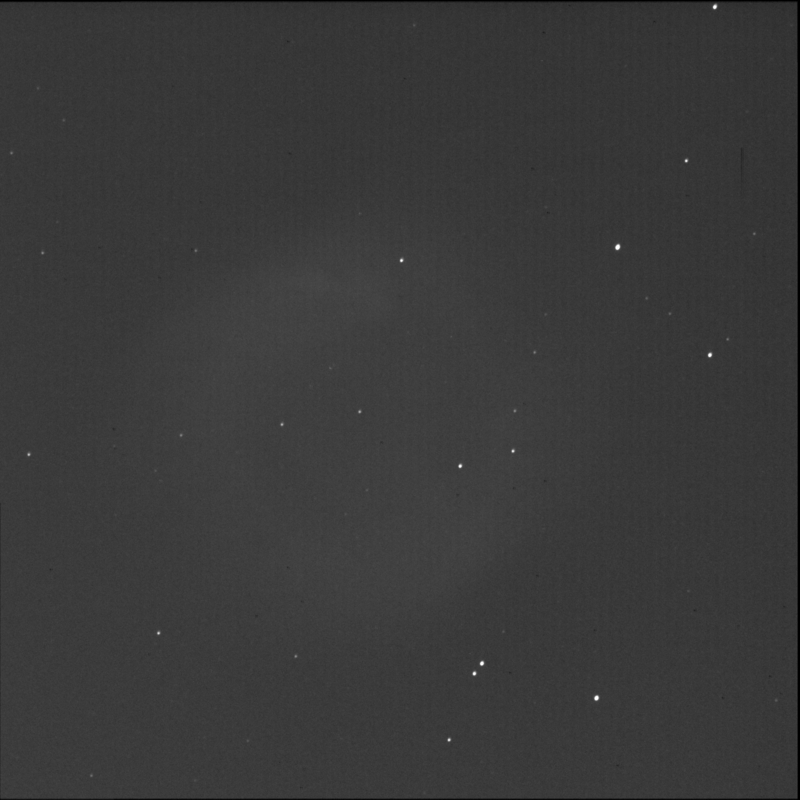 The Burke-Gaffney Observatory imaged a couple of targets for me this evening including NGC 7009. Two years ago I imaged the Saturn Nebula. Exposed the luminance then for 15 seconds. This time I shot faster. All images: FITS Liberator, GIMP. North is up; east is left. Luminance only, 10 seconds subexposures, 15 stacked shots. Hydrogen alpha, 30 seconds subexposures, 15 stacked shots. Ionised oxygen, 30 seconds subexposures, 15 stacked shots. Arguably, they are still blown out, it is such a bright object. 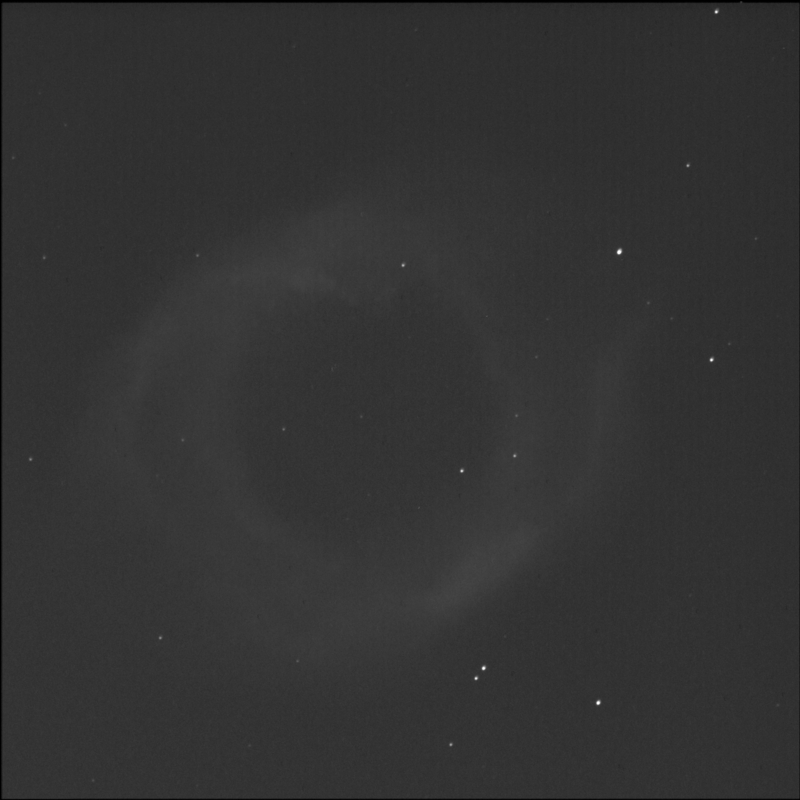 BGO imaged NGC 7293 aka the Helix Nebula. This is a large planetary nebula in the constellation Aquarius. It is one of the RASC Finest NGCs. 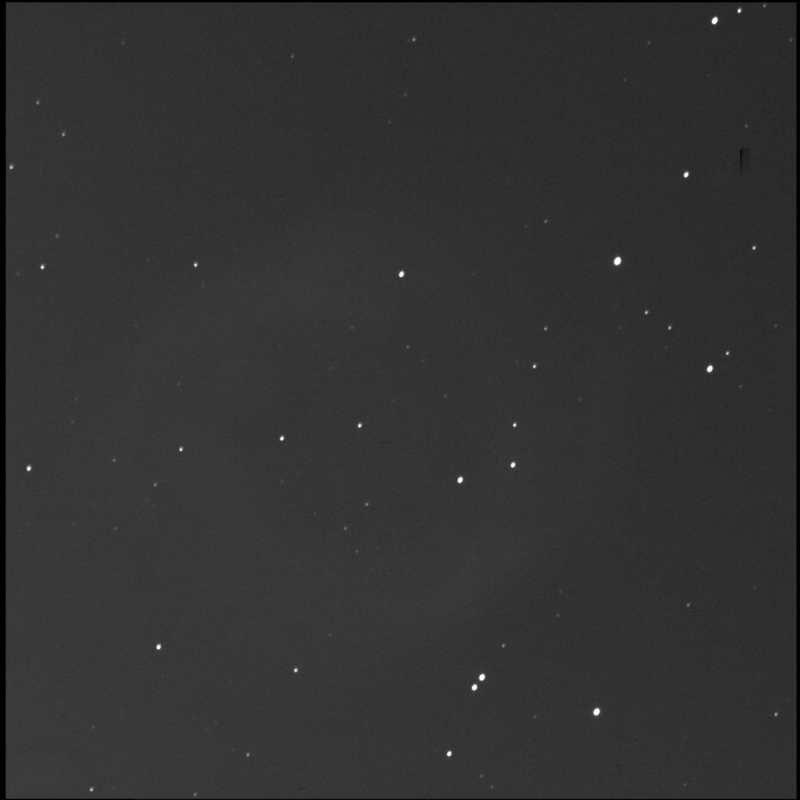 When I started my Finest NGC imaging project with the SMU robotic telescope, I didn't think I'd be able to capture this object, being quite low. But as my understanding of the controls improved, I learned it was possible to reach. Happy to finally image it. H-alpha only, 30 seconds subexposures, 15 stacked shots. O-III only, 30 seconds subexposures, 15 stacked shots.